Image | July 15, 2015 March 31, 2016 | Polar Focus, Inc. The guys were hard at work on the shop floor last week, putting together gigantic pan and tilt adjustable assemblies for use with enormous JBL VTX line arrays with custom subwoofer clusters that are currently being installed at the Honda Center in Anaheim, California; home of the Anaheim Ducks. 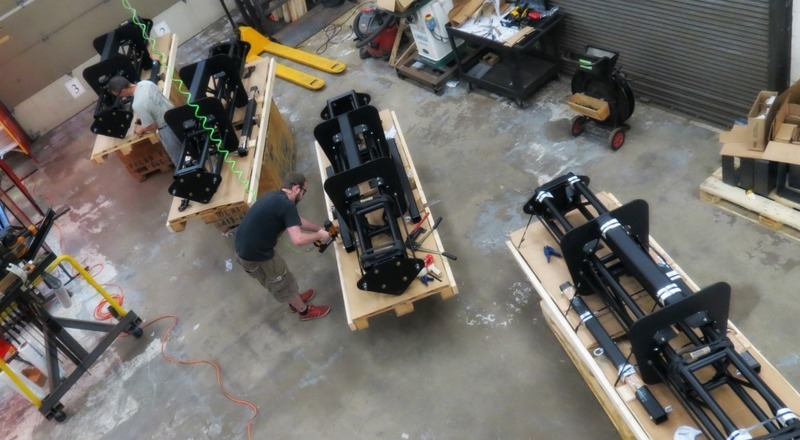 Polar Focus, Inc. assembling pan and tilt adjustable assemblies for use with JBL VTX line arrays. This system is being expertly installed by Diversified Systems. providing rigging systems which are pre-assembled to the maximum extent possible. 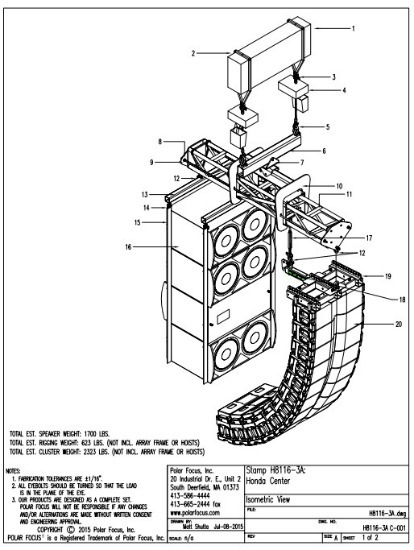 A drawing of the speaker cluster. JBL VTX line array with a custom subwoofer cluster. Polar Focus provides the best value, the best products, and the best service in Audio Rigging. 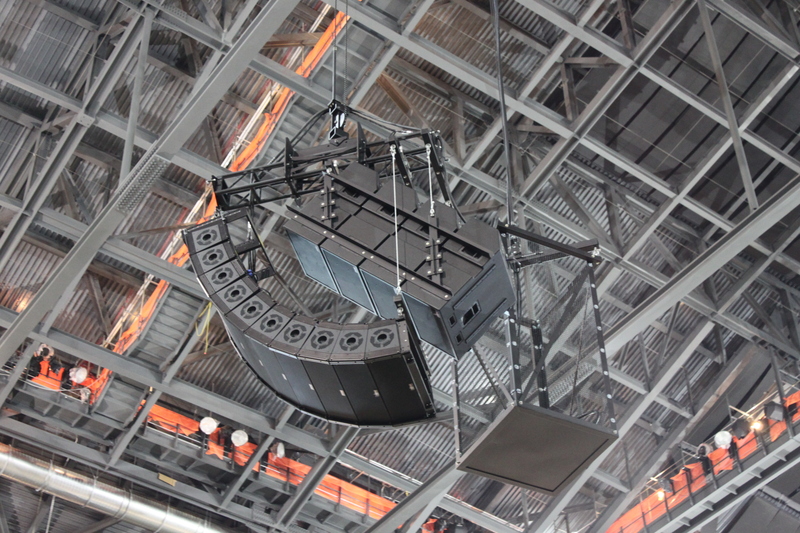 Our turnkey systems form a complete transition from the top of your speakers up to and including the roof attachment. Polar Focus offers a full family of rigging products including Zbeam, Spine Frame Adapter™, Tilt Cable Kits, Motor Zbeam, XY Grid System for cluster construction, LiftAll slings, Stagemaker hoists, wall mounts, pole mounts, line array frames for outdoor applications, and roof attachment products. We also offer design and manufacturing services for custom and OEM products. If you don’t see what you need on our website, we can help! 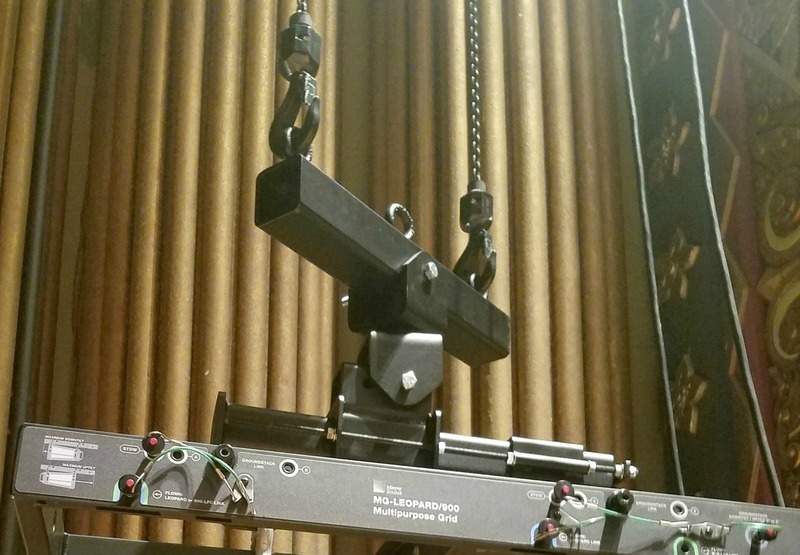 Call our Audio Rigging Consultants at (413) 586-4444. Introducing our new PM3 Pole Mount, designed for Community Professional Loudspeakers IV6 Vertical Array Modules. This Pole Mount is rated to 129 mph, which includes Class 1, 2 and 3 hurricanes. 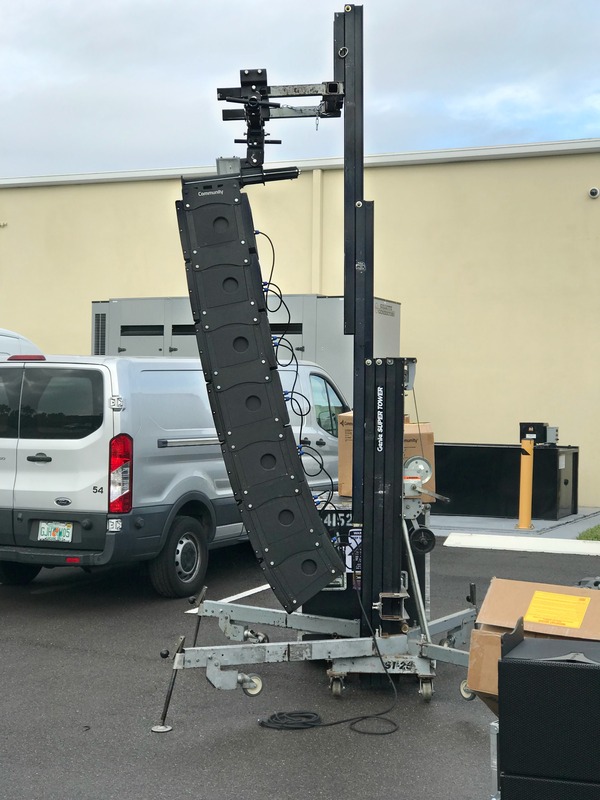 Chris West from S. E. Systems, Inc. in Greensboro, North Carolina got in touch with us for assistance with these d&b audiotechnik GmbH loudspeakers. 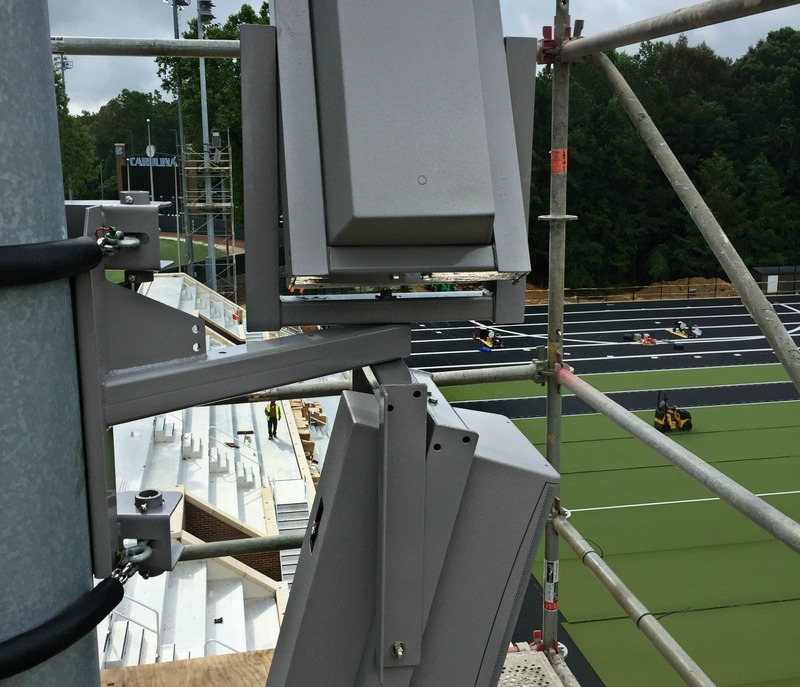 These were installed at The University of North Carolina at Chapel Hill field hockey stadium. Each cluster is comprised of one d&b 24S and one d&b 10S. Polar Focus supplied our standard PM1-17-G Pole Mounts, as well as custom baby seat style yokes for each speaker. Great work Chris and the crew at SE Systems! Go Tar Heels!! Randi Crooks from Magnum Audio Group in Tampa, Florida got in touch with us for assistance rigging these Community Professional Loudspeakers R Series speakers in married pairs on two poles. These four RSH462 and RMG-200-AT were skillfully installed at the county soccer field in Hillsborough, Florida. Polar Focus Pole Mounts on lighting poles are usually the easiest way to rig outdoor speakers. We use stainless steel rigging rated chain and hose kits, which provide a super strong connection that does not void the warranty of the lighting pole. This looks great and will for years to come! Mike’s bike lights bring some holiday cheer to us at the shop! 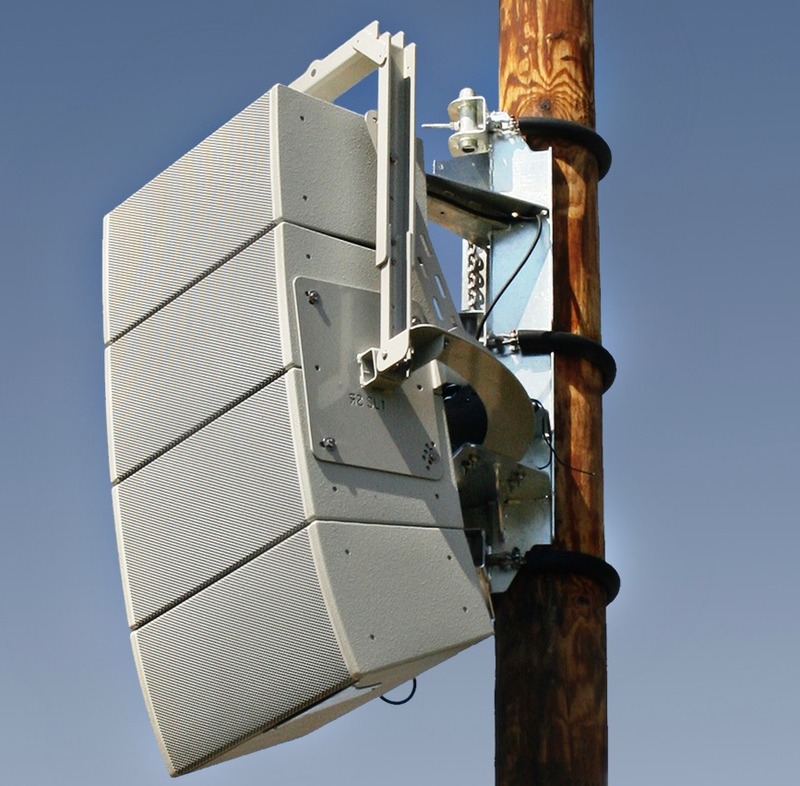 Polar Focus PM3 Pole Mount for Community Professional Loudspeakers IV6 Arrays. Polar Focus rigging for a portable demo rig for Community Professional Loudspeakers IV6 line arrays. 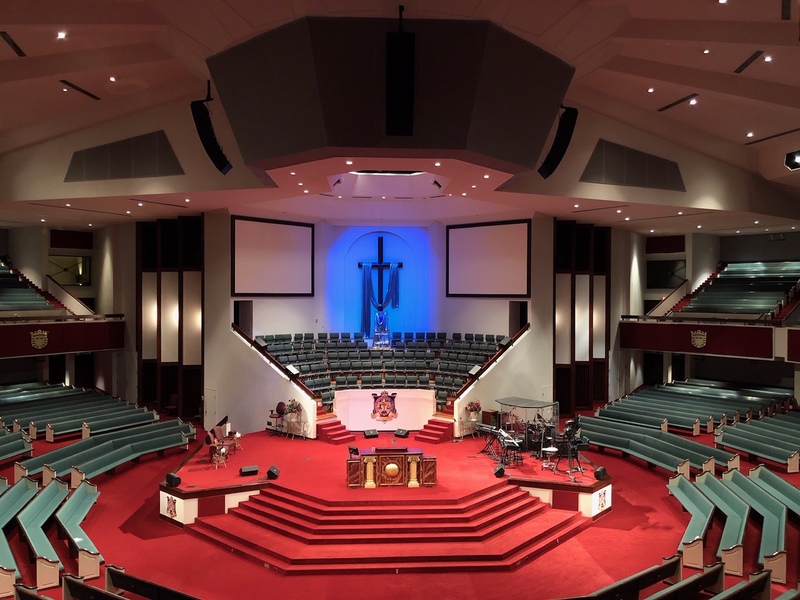 Polar Focus rigging for these Community IV6 line arrays at World Overcomers Church in Memphis, TN. 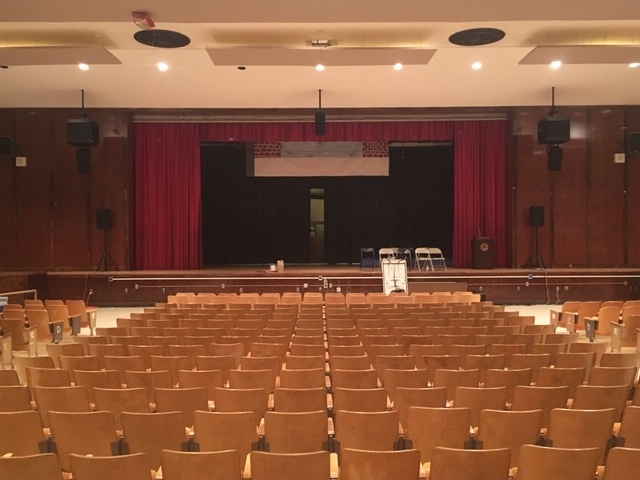 Polar Focus provided custom rigging for these d&b audio speaker clusters at Francis Lewis High School in Queens, NY. Polar Focus rigging for Meyer Leopard line arrays at the Fox Theater in Spokane Washington. Polar Focus Custom Pole Mount at University of North Carolina field hockey stadium. Polar Focus Pole Mounts for Hillsborough County Soccer. 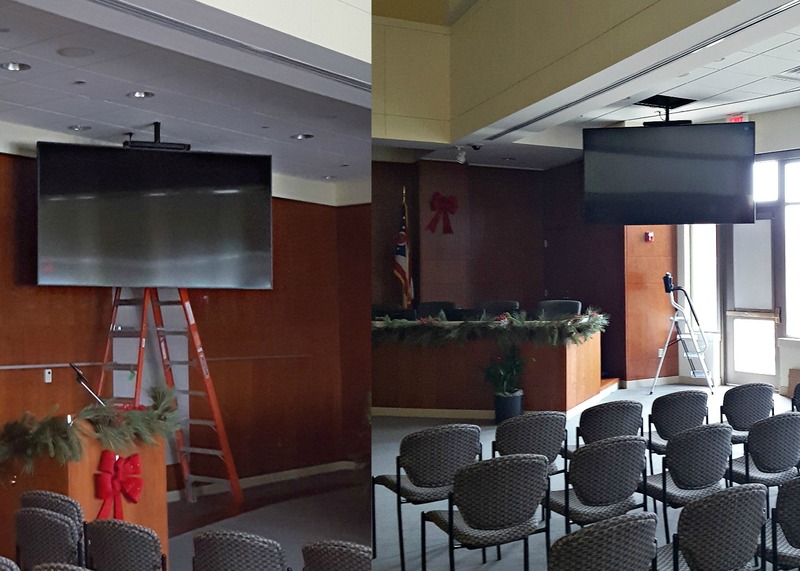 Video screen rigging for City of Mason, OH Council Chambers. Click the photo for more information.